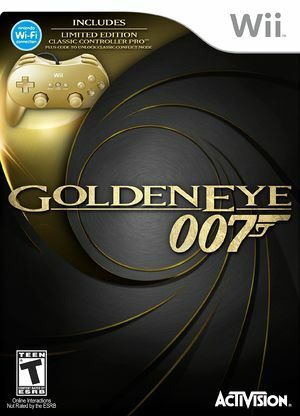 GoldenEye 007 is a 2010 first-person shooter video game developed by Eurocom and published by Activision for the Wii. It is loosely based on the 1995 James Bond film GoldenEye. The new GoldenEye 007 is a reimagining of the 1997 Nintendo 64 video game of the same name, which was itself a loose interpretation of the 1995 film. Pierce Brosnan starred in the film and his likeness was used as the N64 GoldenEye, but the 2010 game uses the likeness of the new Bond, Daniel Craig, and has modified the story and the character to match. Gameplay is very similar to the 1997 game, but with a variety of updates to the AI system, level designs, and of course, an entirely new graphics engine. GoldenEye 007 is capable of using both GameCube controllers and Wii Remotes. If a physical controller is set to emulate both a GameCube Controller and a Wii Remote concurrently, it will operate both devices at the same time. To fix, migrate controls to use separate physical controllers. The graph below charts the compatibility with GoldenEye 007 since Dolphin's 2.0 release, listing revisions only where a compatibility change occurred. 3.0-409 Windows 7 AMD Phenom II X6 1055T AMD Radeon HD 5830 HD 720p - 24-30FPS in one player, and 17-25FPS in 4 multiplayer players depending of the scenario,but stable playable,I forced the FPS for stable in 75FPS for more performance. 3.0-421 Windows 7 AMD Athlon 64 X2 4800+ @ 2.4GHz AMD Radeon HD 4670 Gets about 15~ 20FPS, not perfect but playable. Problems with audio sync. Increased performance using "Fast Mipmaps" and "Fast Display List"
5.0-37 Windows 10 Intel Core i7-6700 @ 3.4GHz NVIDIA GeForce GTX 750 TI Using the D3D Backend, Window Size IR (1920x1080), 8x AF, PerPixel Lighting, solid 30FPS with no framedrops. Graphical Glitches in rooms with shiny floors, the reflections are very bugged. This page was last edited on 3 March 2018, at 07:41.